In a twist of events, Kenya’s main opposition leader, Raila Odinga, has said he wants new elections by August 2018. Speaking on BBC’s Hardtalk, Mr Odinga said he also aimed to create a “people’s convention” to deliberate on issues from regional assemblies – but not appoint ministers. On January 31, Odinga, flanked by a mammoth crowd swore himself in as the ‘people’s president’ in a ceremony that was boycotted by many of his allies. 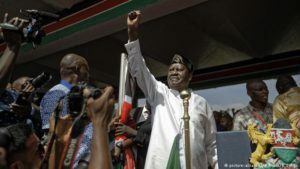 Analysts called the inauguration a flopped public relations stunt, however, Mr Odinga declared that he was answering to a “high[er] calling to assume the office of the people’s president of the Republic of Kenya”. Mr Odinga turned up for just 20 minutes, signed a statement, swore an oath and left the stage, leaving his supporters wondering why it was such a low-key affair, according to analysts. President Uhuru Kenyatta was sworn in for a second term last November, having won an election re-run in October, which was boycotted by Mr Odinga. Meanwhile, the Kenyan government has confirmed kicking lawyer Miguna Miguna out of the country days after he was arrested over the oathing of NASA leader Raila Odinga.